Sometimes, a game can unexpectedly hook you. This happened to me this week when I downloaded Bullet Boy, a simple game about a human cannonball blasting through a beautiful floating world. What started as a few minutes of enjoying Bullet Boy quickly became a half hour of furious tapping as I helped the titular Bullet Boy navigate a maze-like floating city full of cannons. Bullet Boy’s mechanics are so simple they’re almost laughable. Players tap to launch the boy from a cannon which will hopefully land him in another cannon. However, this one-tap gameplay quickly becomes complicated. Some cannons spin, meaning you have to time your taps to reach the next cannon, while others require you to spin them. Some move on their own, sliding up and down or left and right. There are also obstacles like birds that flap by — hit them, and Bullet Boy falls from the sky. A giant tornado pursues you as well, so you have to keep Bullet Boy moving. On top of all this, you get bonus points if you shoot quickly from cannon to cannon, building up a combo for massive points. The game also hides special chests containing pieces of mysterious statues you can collect. Completing levels earns you coins, which you can then put towards power-ups throughout the game. This includes items like the ‘drill helmet’ that lets you tunnel through objects or a ‘ballistics’ powerup that shows your trajectory. Once you beat level 12, the game unlocks ‘Endless mode,’ where players can leap from cannon to cannon endlessly. The game also features several in-app purchases, such as revives that let you resume a level from where you died — you get 20 of these for free — and a $6.99 ‘coin doubler’ that increases your rewards and removes ads. Players can also buy alternate costumes if they get tired of playing as Bullet Boy. 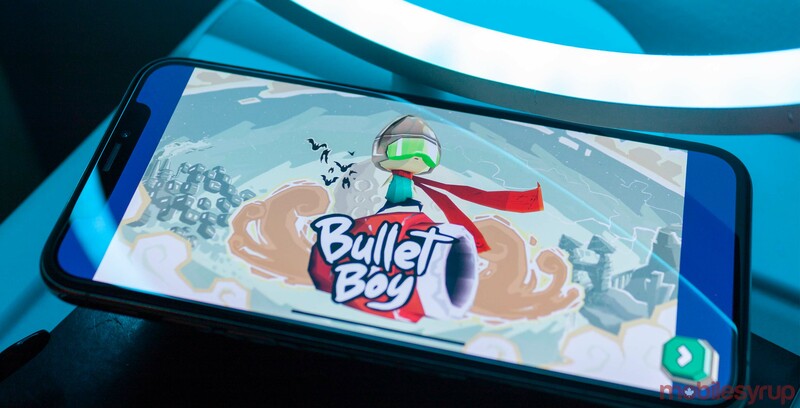 Ultimately, Bullet Boy is a fun game that expertly takes a simple mechanic and transforms it into a challenging gameplay loop. It’s available for free on iOS and Android.